Anyone Wanna Bungee-Jump During The Eclipse? There's nothing iffy about the cliffs: They go straight down. It's $129 for the first jump and $49 for every jump after that. The river is 300 feet below, and jumpers drop 250 feet. The river where the jump would happen is 300 feet below, and jumpers drop 250 feet. MADRAS, Ore.: The eclipse is a moment to connect with cosmic forces and contemplate our insignificance in the grandeur of the universe. And you could do all that while bungee-jumping. There's an old highway bridge over a truly terrifying gorge where the Crooked River cuts through volcanic rock. There's nothing iffy about the cliffs: They go straight down. It's $129 for the first jump and $49 for every jump after that. The river is 300 feet below, and jumpers drop 250 feet. 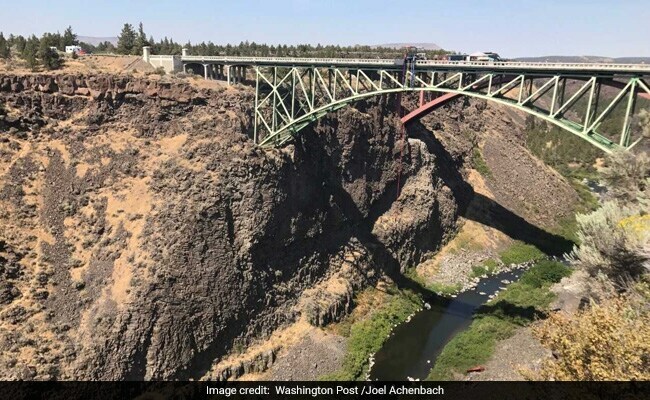 "You don't stay in business long if the numbers are reversed," said James Scott, 44, who owns Central Oregon Bungee Adventures and has personally jumped 172 times. ("It's scary every time," he says.) Scott said he'll be open for business Monday morning on the bridge and won't pause even when the solar eclipse totality arrives at 10:19 a.m.
"Some lucky person will get to jump - once-in-a-lifetime." Experts have been quite clear that a person need not accessorize the eclipse experience with additional stimulation. Just be there in the moment, they say. But it is also the American way to try to intensify experiences, and many people are eager to customize Monday's eclipse, and make it better than merely great (as in, "These go to 11."). "THE MOST LUXURIOUS SOLAR ECLIPSE EVENT IN THE USA!," the company's Facebook post says. "Where will you be for the destination event of a generation? We'll bring the champagne." And there's stronger stuff to be had. At the New Basin Distilling Co., owner Rick Molitor, 50, is opening at 7 a.m. Monday and staging a ticketed chicken-and-waffles breakfast in which he will tap an 11-year-old barrel of whiskey. The price: $500 per person, $750 a couple. No entrepreneur here seems likely to get wealthy overnight. Most of the 100,000 people who are pouring into the Madras area are camping, bringing their own food and supplies, and to judge by the last couple of days they share a remarkable capacity for just hanging out. They've picked the least cloudy place in America, statistically, on the path of totality, and now they're just going to wait for celestial forces to do their thing. There's a big business in camping, too: Will Marquardt, 51, owner of Outdoors Geek, a Denver-based camping equipment rental company, is providing tents to thousands of campsites in the sprawling overnight community called Solartown north of Madras and more tents at the fairgrounds, which is hosting Solarfest. His rental tents are preset, and customers can just take off when it is all over. This is known as "glamping," for glamorous camping. "We're the Netflix of camping," he said of his company. The eclipse gathering is challenging, he said: "You kidding me, this is twice as big as a lot of NASCAR events. This is almost twice Watkins Glen. It's a humongous undertaking." The phenomenon is astronomically transient, so the question for towns like Madras, a farming community, and nearby Prineville is whether the eclipse chasers who come here will come back in years to come. "People are going to realize there's a lot more to do than just watch an eclipse," said bungee-jumping entrepreneur Scott, moments before another person plunged screaming and hollering from the bridge. Jim Roths, 60, owner of the restaurant Club Pioneer in Prineville, said his community is undergoing dramatic change with the arrival of data centers run by Facebook and Apple. His restaurant has been around for close to three-quarters of a century and used to be a rough place back in the days when Prineville was primarily a timber town. A painting on the wall of poker players has a triangular hole where someone hit it with an arrow fired from a crossbow. He has made the restaurant more upscale. "We have to reinvent ourselves. The town feels different than when I came in '09. It felt depressed. The biggest thing to have happened to us are data centers," he said. "When you post something on the Web and it goes to the Cloud, it really just comes to Prineville."